It’s 7:30 on a misty April evening in San Luis Obispo, where Madonna Road dead-ends into the Irish Hills Natural Reserve. The sun is beginning to disappear behind the mountainside. SLO resident Christie O’Hara, clad in a spandex jersey, methodically straps on her helmet, adjusts her gloves, and places a big pair of athletic glasses over her eyes. She then reaches forward to turn on the light mounted on the handlebars of her black mountain bike. TWILIGHT RIDE : Christie O’Hara rides her mountain bike at Irish Hills Natural Reserve shortly after sunset. It casts a searing beam out in front of her. “Sometimes I’ll wear kneepads, but not for this trail,” the 31-year-old Cal Poly biomechanics researcher says, before starting up the Mariposa trail that meanders through the open space. As a native to the New York City area, O’Hara didn’t know much about mountain biking growing up; road cycling and running were her big hobbies. When she moved to SLO in 2009 to pursue a master’s degree in kinesiology at Cal Poly, everything about the city’s “greenbelt” inspired her: the bountiful open spaces, the vast network of trails, and the warm community of locals who cherished them. “The trails out here are amazing,” O’Hara says. Volunteering at “trail work days” hosted by the Central Coast Concerned Mountain Bikers (CCCMB) organization brought O’Hara even closer to the land and its stewards—and introduced her to the sport of mountain biking. She’s now the vice president of CCCMB. Enveloped in canopies of tree cover, O’Hara checks her watch, which tells her the sun just set. In one hour, the Irish Hills will be closed and she could get a $561 ticket if she’s still out on the trail. O’Hara always obeys the city’s open space hours, but she thinks it’d be nice if night rides were allowed. 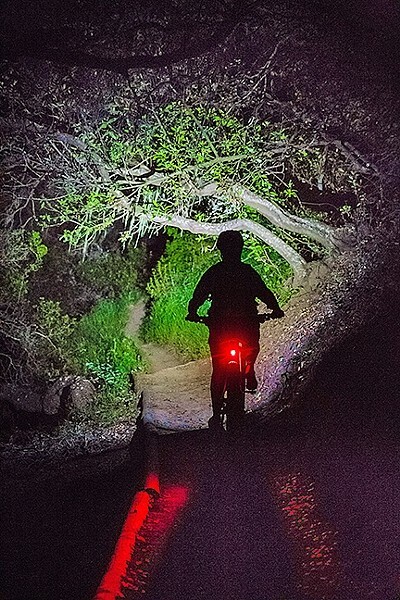 In the winter, when after-work sunlight is scarce, O’Hara and her friends will go for weekday night rides in Montaña de Oro State Park, which is open until 10 p.m. But that’s at least a 30-minute drive away. “It’d be nice to be able to ride in Irish Hills and not have to drive all the way out there,” she says. O’Hara’s just one of many mountain bikers, trail runners, and hikers in the community who have recently asked the city to consider relaxing its open space hours to allow for legal recreation after dark. In the 20-year history of SLO’s public open space, the hours have held firm: open from one hour before sunrise, to one hour after sunset. A recent push by the city to more strictly enforce the open space rules has pushed the debate squarely to the forefront. On March 21, the SLO City Council asked its staff to craft modifications to the open space ordinance that would allow for some “after hours” recreation at a few locations, and only during the winter season. But the impact of any amount of nighttime activity on SLO’s natural reserves—and the diverse wildlife that calls those spaces home—is not well understood. The council’s decision is drawing strong criticism from community members who question the wisdom of altering the original open space policy and subjecting the open space wildlife to more human impact after dark. Those in favor of night hiking point out that 80 percent of the open space areas are already off limits to recreation; so opening a few trails could be a small slice of impact. The debate hits as the city is putting forth a 20-year vision plan for the SLO open space program. Some residents view night hiking as complementary to that vision, others see it as completely in conflict. Back in 2015, the SLO City Council decided to take a no-nonsense approach toward violators of the open space regulations, ramping up enforcement to unprecedented levels. The city added three new ranger positions and boosted the funding allocated to patrolling—as well as other open space goals like signage improvements and maintenance—by about $150,000 per year. “We were more education-focused before, given the resources,” Carscaden said. VISION PLAN SLO : Natural Resources Manager Bob Hill (center) listens to feedback from open space stakeholders on a 20-year vision plan for the city’s greenbelt on April 25. Last August, three SLO County residents attended a City Council meeting and asked if the city would reconsider its stance on night hiking. They said the current hours made going out on open spaces in the winter impossible before or after normal work hours. The council at the time voted 3-2 to have a discussion about the open space hours at a later date. On March 21, with a new mayor and two new councilmembers, the City Council had that discussion and voted 4-1 to ask for a night hiking “pilot program.” The program would apply to a few locations, possibly Laguna Lake Park and Cerro San Luis Obispo (the hill with the “M” on it, also known as Madonna Mountain), with “optimized” hours, so that in the winter, some after-work recreation could legally take place. The council quickly eliminated Bishop Peak as a candidate for any night hiking. But the council’s perceived lenience has some community members very concerned. Former Mayor Jan Marx, current Councilwoman Carlyn Christianson, and other longtime city leaders like former Mayor Peg Pinard are opposing the proposal, joining local environmental groups like the Santa Lucia Chapter of the Sierra Club and the Environmental Center of SLO (ECOLO). They’re primarily concerned about the effects of nighttime recreation on the open space wildlife. “Has there been an environmental impact report?” Marx asked in a scathing April column in the Santa Lucian, a monthly Sierra Club publication. In a nutshell, opponents to the council’s proposal believe that it sets a dangerous precedent for the city, that it’s a step down a slippery slope toward degrading the original, essential purpose of the greenbelt: natural preservation. 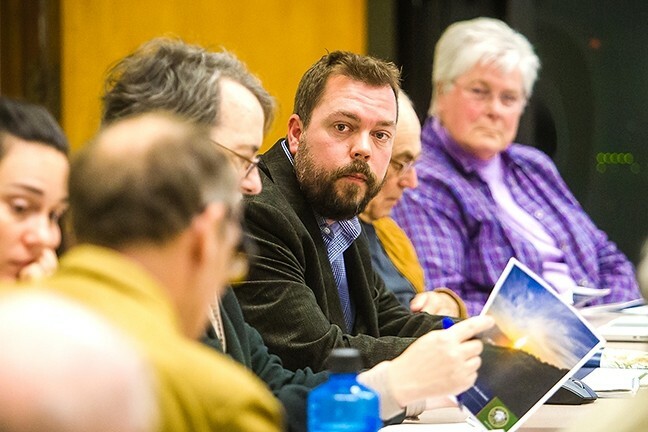 They argue that the very concept of night hiking conflicts with the city general plan, which prioritizes the protection of open space natural resources ahead of human recreation. Opponents feel like it toys with the hard-fought, expensive effort it took to acquire and preserve the city’s open spaces over the years. SLO launched its Greenbelt Protection Program in 1995. Since then, the city’s managed to acquire 13 open space areas covering 3,850 acres, with more than 50 miles of trails. The regulations for the open space—including the hours of use—were established in 1998. SLO’s dawn-to-dusk open space hours are on par with comparable jurisdictions like the Santa Clara Valley Open Space Authority and the Mid-Peninsula Regional Open Space District (on the San Francisco Peninsula), but are more stringent than SLO County Parks, which are open from 6 a.m. to 10 p.m.
No one who spoke with New Times about night hiking in SLO was under any illusions that isn’t already happening—and has been for years. The simple reality is that some people do it; they either don’t know what the rules are, or decide it’s OK to break them. “Night hiking” has different contexts and meanings, too. In some cases, it equates to rebellious teenagers looking for a place to drink. In others, it’s a serious mountain biker who may also have helped build and maintain the trail he or she is using. Connor Culhane, president of the CCCMB, wants to decouple those very different uses of the open space at night, and focus closely on the merits of allowing more legitimate open space recreation. “Campfires, camping, transients, drinking, and smoking—those are all against the rules already,” Culhane said. On an afternoon in April, Culhane joins O’Hara and CCCMB old-timer Bill Jenkins for a cup of coffee in downtown SLO. Speaking cautiously and deliberately, Culhane demonstrates he’s considered the pros and cons of night riding from many angles. His life experience in the city is also deep. Growing up in the neighborhood next to Bishop Peak, many of Culhane’s formative experiences in nature happened in SLO open space. Culhane said he and the CCCMB are “big advocates” of protecting the greenbelt. “I had such powerful experiences on Bishop’s Peak as a kid,” he said. Formed in 1987, the CCCMB is a nonprofit that partners with land managers, including the city of SLO city, to build and maintain biking trails and advocate for trail access. In the city, volunteers with the CCCMB helped build the trails zigzagging through Johnson Ranch and the Irish Hills, Cerro San Luis, Reservoir Canyon, and Stenner Springs. The popularity of sports like mountain biking and trail running is on the rise on the Central Coast, Culhane said. A modest extension of the open space hours is meant to provide active residents more outdoor opportunities in an ever-busy and digitally oriented world. And for experienced riders like Culhane, Jenkins, and O’Hara, night rides offer a unique experience, too. “A ride at night is almost like a new trail. … It’s a different experience,” said Jenkins, who’s been apart of CCCMB since around the time of its inception. In its letter to the SLO City Council, the CCCMB asked for after-dark access to the open space areas the organization has poured its trail efforts into. Culhane suggested new year-round hours of 5 a.m. to 9 p.m., a proposal that 85 percent of CCCMB members supported in a survey. While the council may not go that far, Mayor Harmon said she’s inclined to consider the proposals from CCCMB and other outdoors groups, like the SLO Trail Runners, in large part because of their positive standing in the community. Evan Albright, a city open space docent for ECOSLO, stands shoulder to shoulder with Mayor Harmon in Laguna Lake Park on a peaceful April night. He’s honest and respectful in sharing his reservations about allowing night hiking. Harmon listens intently to Albright, nods, and says “mmhmm” in agreement. You can tell the first-term mayor, an avowed environmentalist, isn’t taking the issue lightly. The city really does need a Lorax, because it’s tough to find conclusive research measuring the impacts of night hiking on wildlife. A 2012 night hiking study commissioned by Boulder, Colo.—a city facing some of the same open space management dilemmas as SLO—indicated some impact to wildlife. The flashes of headlamps or bike lights can be disruptive to animals’ “natural patterns of movement and foraging,” and could cause long-term changes in vigor. The study concludes, though, that the severity and scope of the impact is unknown. Research generally shows that open space recreation can have a negative impact on wildlife, especially on mammals like coyotes and bobcats. One Canadian paper summarized research on mountain biking impacts, showing varying levels of impact to soils, vegetation, and wildlife; but the study also found significant gaps in the data available. SLO’s best understanding of the wildlife in its own greenbelt is from the conservation plans written for each open space area. Whenever a conservation plan is updated, the city takes an inventory of the plants, insects, birds, and animals that make up that space. But it’s just a snapshot in time; the inventory doesn’t shed much light on the behavioral patterns of the animals, nor does it measure our impact on them. The city hopes to learn more through wildlife cameras recently stationed in the open space areas. But one fact about open space is obvious. Wildlife is accustomed to a steady routine of heavy impact during the day (as many as 1,000 people per day visit Bishop Peak and Cerro San Luis) and relative peace at night. Even for animal species that aren’t naturally nocturnal, the presence of humans throughout the day essentially makes them so; that’s called temporal displacement. Mary Ciesinski, executive director of ECOLO, said her organization shares those concerns. O’Hara said she never ever goes out mountain biking alone—but she knows a friend who does. 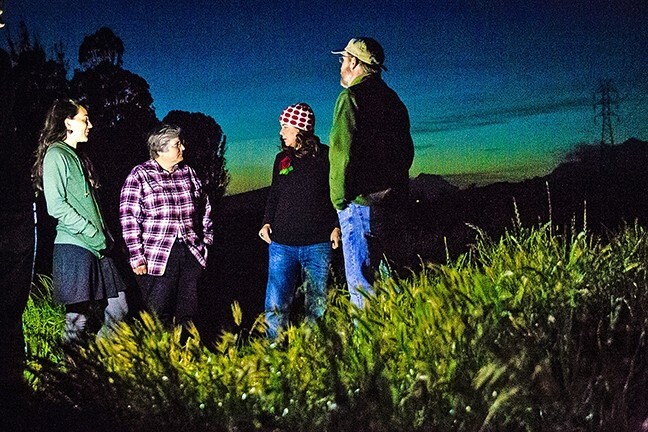 SENSITIVE HABITAT : Mary Ciesinski, executive director of ECOSLO; Carolyn Huddleston, ECOSLO docent; Heidi Harmon, SLO mayor; and Evan Albright, docent, (left to right) discuss the issue of night hiking at Laguna Lake Park. That brings up a safety issue for the city, especially if a biker or runner is out alone at night and gets into trouble. Emergency rescues in open space are costly and dangerous. There’s also the liability question. City officials have said allowing night hiking would indeed place a new burden on emergency teams, since getting out to a rescue spot in open space can be hazardous, and often results in minor (but not insignificant) ails like poison oak. The safety and rescue issues were ones brought up by many community members in correspondences with the city in March. The CCCMB has a counterargument for it. “CCCMB believes that generally speaking nighttime trail users are much more likely to be familiar with a trail and more experienced in using it than daytime users,” Culhane wrote to the City Council, adding that considerably fewer riders will be out at night compared to during the day. Culhane pointed out that cyclists and pedestrians are actually probably safer on the open space trails than they would be on the road with cars. The bike lights are also improved: They’re brighter and more portable, so visibility is no longer a big factor. Many people see positive consequences for night hiking too. There’s a theory that the new policy may take some stress off of Bishop Peak and the heavily impacted adjacent neighborhood. The other positive outcome is that it could incentivize residents to break away from their phones and computers and get into the outdoors more for exercise. Resident Brent Vanderhoof can vouch for that. In a letter to the city, Vanderhoof said that because of SLO’s open space trails, he transformed himself from a “40-year-old somewhat overweight smoker into one of trail running’s biggest advocates.” He now runs 50-plus miles per week. “While I can enjoy the trails on the weekend for the majority of my training, it’s necessary to get out there during the week as well; which means at 5 a.m. or after work [when it’s dark],” he said. In 2016, in honor of the 20th anniversary of SLO’s Greenbelt Protection Program, the city convened a group of 15 local open space stakeholders—from members of the Land Conservancy of SLO County, to the CCCMB, to the Madonna Enterprises—for a series of roundtable meetings. The goal? Collaborate on a “vision plan” for the city open space over the next 20 years. There’s a tension in the air as members flip through the booklet. One person asks if Hill could take out a photo of mountain bikers in open space and replace it with a photo of hikers. Another member suggests the document should be structured to make it clear that open space’s primary purpose is to protect natural resources (and not human recreation). While Hill’s work encapsulated a breadth of long-term aspirations for “completing the greenbelt,” like establishing more conservation easements in the Cuesta Canyon and Edna Valley areas, the tensions about night hiking palpably filled the room. Ciesinski, a roundtable member, emphasized to New Times that the passion around this debate isn’t just about night hiking. It’s about the larger question: What’s the fundamental purpose of an open space program? “The reason why people started this 20 years ago is they wanted natural resource protection primarily—that was number one,” Ciesinski said. Former SLO Mayor Pinard, a city councilwoman from ’87 to ’96 and then a county supervisor from ’96 to ’04, is one who sides with resource protection. In a recent letter to the council, Pinard pointed out the financial commitment city dwellers have made toward open space through tax measures, general plans, and major goals. She called the night hiking proposal a “bait and switch” on taxpayers. Hill is sort of stuck between a rock and a hard place: He has the responsibility of carrying out the City Council’s policies for the open space, yet he doesn’t get to call the shots. It’s a difficult balancing act. This summer, Hill will tackle crafting the new night hiking policy. In considering what open spaces to choose for the pilot program, Hill will weigh several factors, including user safety, the location of the trailhead (with preference to trailheads not in neighborhoods), and where wildlife might be least impacted. In the meantime, stakeholders in the community will continue to weigh in and stand up for what they believe is appropriate for open space. Mayor Harmon understands the passion behind the issue, but she said some of the critiques thrown at the City Council lately are hyperbolic. * CORRECTION: SLO Natural Resources Manager Bob Hill was incorrectly quoted in the original story. The night hiking policy would require an environmental review before a full environmental impact report. MAY 18, 2017.